Los Angeles, CA – An all-star gathering of musical luminaries bring their warmest performances to a brand new tribute album featuring 16 acoustic renditions of the best song’s by The Beatles! 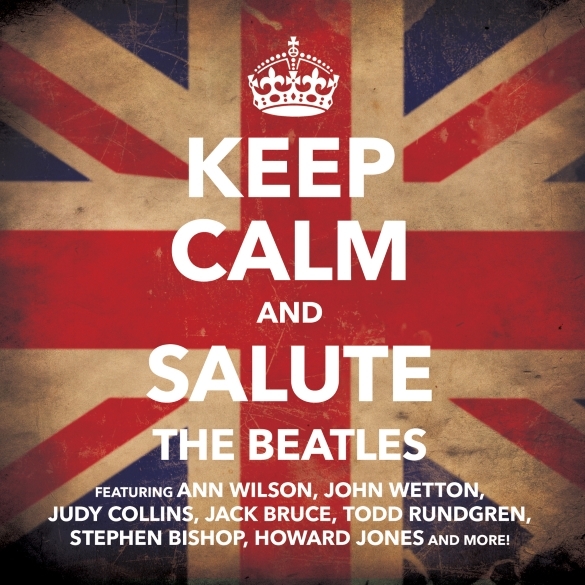 Keep Calm And Salute The Beatles offers heartfelt and inviting contributions by artists such as famed Heart vocalist Ann Wilson, who leads an elegant and meditative take on “Across The Universe,” while fellow Brit John Wetton belts out a passionate and playful version of “Penny Lane.” Another of the album’s highlights is a devastating interpretation of the mournful ballad “Eleanor Rigby” recorded by legendary Cream vocalist Jack Bruce just prior to his passing in late 2014. It was Bruce’s last recorded performance and a testament to the man’s prodigious talent and sincere passion for music. Other incredible performers include legendary Todd Rundgren, singer/songwriter Andrew Gold, Martha Davis of The Motels, ‘80s icon Howard Jones, Stephen Bishop and so many more. The entire project was overseen by producer extraordinaire Billy Sherwood (Yes), and will be made available to the public on April 28. Any Beatles fan worth their salt won’t want to miss it! This entry was posted on Tuesday, April 21st, 2015 at 19:52	and posted in Uncategorized. You can follow any responses to this entry through the RSS 2.0 feed.